Must have met the benchmark (THD) within the last 12 months from the commencement date of the carding, to be considered for SSC carding nomination for L1-L3 carding. Carding of relays: Only the Athletes who actually ran the required time will be recommended for carding. The number will not be restricted to four. Carding criteria will be based on the targeted Major Meet of any particular year. Athletes/coaches must execute the “SAA’s Athlete/Coach Agreement” before being eligible for the funding*. Payment shall be done quarterly upon submission of training, competition & attendance reports. Carding payment will start from the month the Athlete meets the criteria during any particular Quarter. All carded Athletes are subjected to quarterly review by the SAA’s Training & Selection Committee. If an Athlete’s performance “dips” after 2 quarterly reviews, without valid reason/s, SAA’s Training & Selection Committee may recommend stopping of funding. SAA Senior Carding Criteria for 2013/14 /15 will be based on SEA Games 2011 results. Any athlete who meets the required marks based on his/her results achieved from July 1 2012 onwards will be considered for carding and receive the carding allowance from Jan 1 2013 – June 31 2013. Carding for Junior Athletes preparing for the Asian Junior 2014 Championships will be based on the 2012 Asian Junior results qualifying mark. In order to qualify for junior category carding, Athletes preparing for the Asian Junior Championships, must be age-eligible to compete in the 2014 Asian Junior Championship. Otherwise they will not be carded under Junior Carding even though they meet the mark. SAA Junior Carding Criteria for 2013/14 will be based on the 2012 Asian Junior results. Any athlete who meets the required marks based on his/her results achieved from July 1 2012 onwards will be considered for carding and receive the carding allowance once he/she meets the carding criteria and will also continue to be carded from Jan 1 2013 – June 31 2013. Athletes’ results from 1 Jan 2013 – 30 June 2013 will be considered for carding and they will receive the carding allowance from 1 July 2013 – 31 Dec 2013. Carding for Youth Athletes preparing for the SEA Youth Championship 2013/14 will be based, first, on the 2012 SEA Youth Championship results. 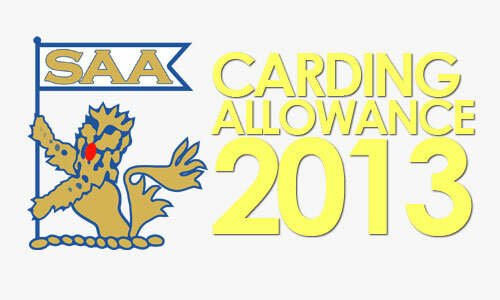 Carding for Youth Athletes preparing for the 2013 SEA Youth Championship will be from May 2012 onwards. In order to qualify for Youth category carding, Athletes preparing for the SEA Youth Championship, must be age-eligible to compete in the particular SEA Youth Championship. Otherwise they will not be carded under Youth Carding even though they meet the mark. Any Athlete who meets the required marks based on their results achieved from May 1 2012 onwards, will be carded immediately till Dec 31 2012. Results obtained from May 2012 – Dec 2012 will be used to card Athletes from Jan 1 2013 – June 30 2013. A new set of carding criteria will take effect after the SEA Youth 2013 Championships. There is no limit as to the number of events for which any coach or athlete can receive carding allowance. As long as the Athlete meets the requirement, both the Athlete and Coach will be paid. However, an Athlete/Coach will only be eligible for carding in his/her highest category, if he/she qualifies for carding for more than 2 categories in the same event. SAA’s carding system will be under review yearly or as when necessary. SAA reserves the right to review and amend the qualifying criteria for carding in any Category at any time. Athletes will be transferred from Youth to Junior or from Junior to Senior as they cross the age limit. This transfer will affect their carding status. They will have to meet the respective carding criteria for their new age category.